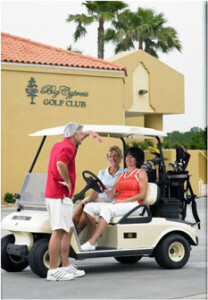 Cypress Lakes is an award-winning golf community in Lakeland, FL, that has long been immensely popular among both retirees and older adults still working. Our residents hail from elsewhere in Florida, many U.S. states – even a few foreign countries. All of them are united in their desire to lead a fun-filled Florida lifestyle in a safe, tight-knit community that is close to world-class health care facilities and other local conveniences. Many Cypress Lakes residents were initially drawn to our community in Central Florida by virtue of the fact that we have two extraordinary golf courses that offer challenging play for golfers of all skill levels. Boasting some of the finest greens in Central Florida, our courses are meticulously cared for on a year-round basis and play a significant role in everyday community life. • South Course – This is a par 72 course measuring an impressive 6,680 yards at its longest. It features Diamond Zoysia greens (installed in 2014), Bermuda fairways, 21 bunkers, multiple water hazards, and four sets of tees. • North Course – An executive course designed by noted golf course architect Chip Powell, the North Course is 3,494-yard par 60 featuring 12 par 3s. It has Tifdwarf greens, Bermuda fairways, 17 sand traps, and several water hazards. The North Course is ideal for anyone looking to sneak in a fast 18! If you are attracted to the idea of living in a golf community like Cypress Lakes, we invite you to contact our Lifestyle Team to schedule a visit. We offer tours seven days a week as well a Stay & Play Program – a three-day, two-night experience that is designed to give you an in-depth understanding of what being a resident of Cypress Lakes is like.